Note the bar stools are not included in the cost of the Amish kitchen island but can be added to your order. Guests and family will be exclaiming Ooh La La to this French Country Kitchen Island. This Amish handcrafted kitchen island has one room large drawer and two cabinet doors with an adjustable shelf. French country furnishings can transform your kitchen into a casual, comfy and happy place. This is a great kitchen island for a small kitchen. 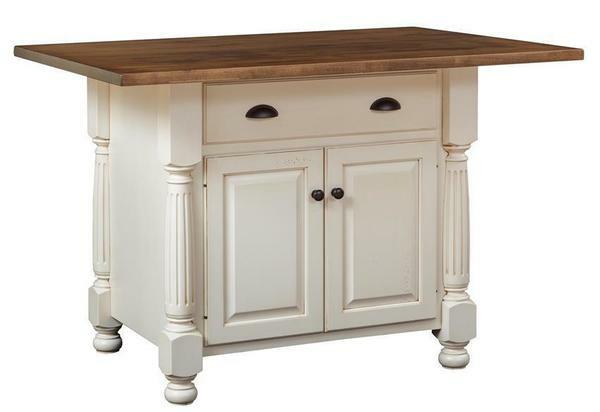 Pair this kitchen island with some complementary French Country Bar Stools or Counter Stools. If you are looking for a larger or smaller kitchen island top or base, please call one of our Amish furniture specialists for a custom furniture quote. DutchCrafters offers custom made furniture with quality construction.